A Ferry at the Portland terminal in GTA Liberty City Stories. The Ferry is a major link between Portland and Staunton Island during the construction of the Callahan Bridge circa 1998 in Grand Theft Auto: Liberty City Stories. The ferry service is evidently a system of motorized boats capable of carrying road vehicles and pedestrians. The entire system consists of two ferry terminals (one in Harwood, Portland and the other in Rockford, Staunton), and two identical large, blue-and-white ferries that alternate between both terminals. In order to use a ferry service, player must wait until a ferry is docked at a ferry terminal, at which point a yellow halo marker will appear on the dock in front of the ferry. The player must then drive or walk into the halo, and press a button in order to confirm entry into the ferry. Each ferry ride is $25. The journey can last for up to two minutes, due largely to the slow speed of the ferry, although the player can skip to the period when the ferry arrives at its destination to save time. Like the subway trains, the ferries cannot be stolen and controlled. Neither can the player jump onto the ferry, as there is no solid platform to land on. An alternative to the ferry is the incomplete Callahan Bridge. After "Driving Mr. Leone", a ramp is added on the gaps on the bridge, allowing the player to jump over to Portland or Staunton via this link. The ferry service is threatened by two new road links, the Callahan Bridge and Porter Tunnel, both of which are under construction during events in the game. The possible obsolescence of the ferry service spurred union members to stage a strike that momentarily shut down ferry services, cutting Portland off from the rest of the city. It is only after assurances by the mayor's office that some of the workers returned to work (as depicted during "Driving Mr. Leone"), returning the ferry to normal service. It is implied the ferry system was ultimately shut down following GTA Liberty City Stories, as little remains of the service during events in Grand Theft Auto III, which is set three years later, in 2001. The Portland terminal is presumed to have been demolished for the Portland exit of the Porter Tunnel, and a few warehouses were erected in place of the Staunton terminal. The Ferry map in GTA San Andreas. The Staunton ferry terminal features two ferry docks, implying the terminal may had formerly served two ferry lines, one possibly leading to Shoreside Vale. 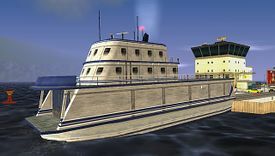 The concept of a ferry for GTA III was brought up during the development of the game. In GTA San Andreas, a San Fierro ferry map appears in standing signs on the boardwalk of Santa Maria Beach. The texture is internally named "CJ_FERRY_MAP". In the first trailer for Grand Theft Auto IV a ferry is shown, named "Liberty Ferry", suggesting that the ferries would be present in Liberty City; however, the ferries were unusable in the game (there are, although, ferry terminals in Alderney, and ferries connect Castle Garden City, Algonquin, with Happiness Island, but they can't be used by the player). If you attempt to access the Portland Terminal while the union is picketting, the protestors will attack you. Union picketing at the Harwood, Portland ferry terminal during GTA Liberty City Stories' Portland mission string. The Harwood ferry terminal in operation, GTA Liberty City Stories. The Rockford, Staunton ferry terminal, GTA Liberty City Stories. The ferry fleet in GTA Liberty City Stories consists of two ferries that alternate between the two ferry terminals. This page was last modified on 6 August 2012, at 22:45.